Praised be Congressman John Lewis and all others who are boycotting Trump's inauguration | Jon Katz, P.C. Praised be Congressman John Lewis — and all other boycotting government officials — for boycotting Trump’s inauguration, after attending all prior inaugurations while a member of the House of Representatives. 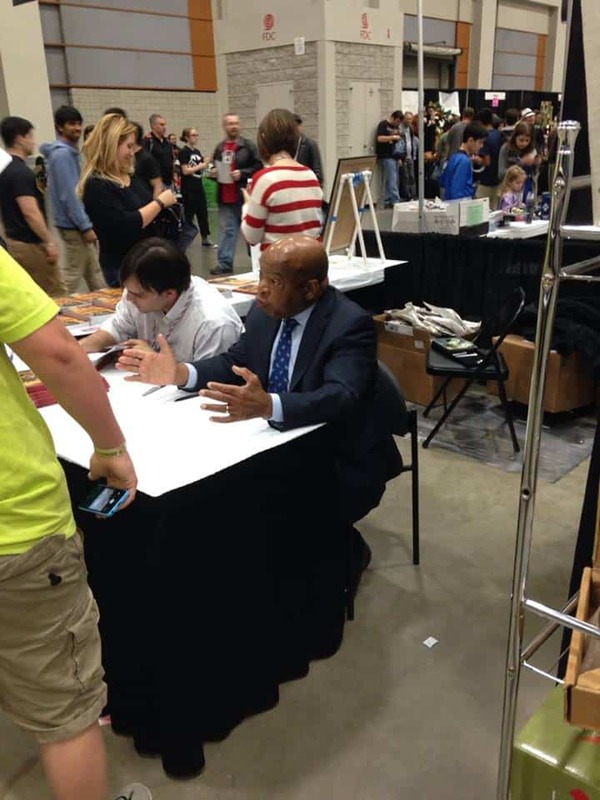 At the April 2014 Awesom Con (Washington, D.C.) (pictured here) my son and I happened upon Congressman Lewis signing his then-new book about the civil rights movement — in comic form — entitled March, which has by now been issued in three award-winning volumes. His trilogy follows in the steps of the non-fiction comic Martin Luther King and the Montgomery Story. I highly recommend the trilogy to everyone. Trump continues being a loose cannon on Twitter and beyond, including his misplaced vitriol after Congressman Lewis confirmed his boycott of Trump’s inauguration. Trump campaigned about regaining international respect for the United States, but his egomaniacally loose cannon buffoonery does the opposite. Trump continues not taking his upcoming role as president seriously enough, to the point of boasting at his news conference last week that he effectively could serve as president AND run his real estate business. Being the president of the United States is a full-time job that requires readiness and vigilance every moment, with the assistance of top-notch staff. Instead, Trump boasts about the quality of his cabinet appointees and makes one wonder whether he will sit back for the ride rather than take over the controls from them when that is needed. Thanks again to John Lewis for boycotting Trump’s inauguration.